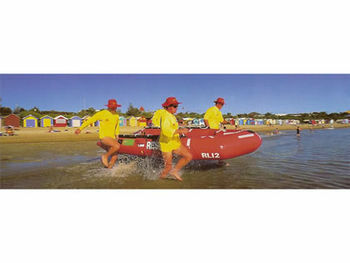 Dendy Street Beach, Brighton is the home of the Brighton bathing boxes, a popular Bayside icon and cultural asset. It is approximately 13 km south of the City of Melbourne and is accessible by road, rail, bus and sea. The nearest road intersection is Dendy Street and the Esplanade, Brighton (Melway Greater Melbourne map reference 67 C12/76 C1). Bayside City Council provide a user pay car park. If undertaking a scenic 500 m walk via Green Point from Brighton Beach Railway Station, which is the end of Zone 1 (from City) on the Sandringham line or user pay car park, visitors may view part of the Bayside Coastal Art Trail where sign boards compare actual with notable Australian artists' paintings, the Brighton bathing boxes, Brighton dunes and the Melbourne skyline.